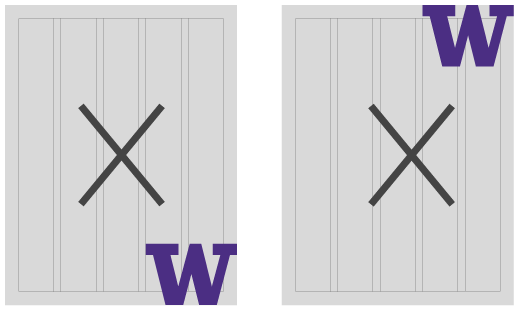 Our Boundless W is simply a graphic treatment of the University Block W logo. What makes it boundless? When it aligns to the bottom or either side of a frame edge it creates the appearance of bleeding off the page — giving it the feeling of not being contained. 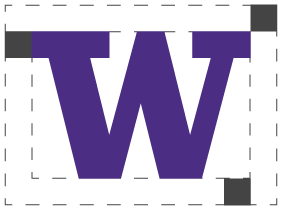 Our University wordmark is a partner to the Boundless W and should appear opposite the Boundless W on the page. The Boundless W can scale from its minimum size 0.875” to 30% of the longest edge. A clear area equivalent to the height of the serif on the Boundless W Logo must be preserved around the complete Logo. Non-signature elements such as type or images (excluding a background treatment) may not encroach on the clear area. Our Boundless W can bleed off the bottom or one side. 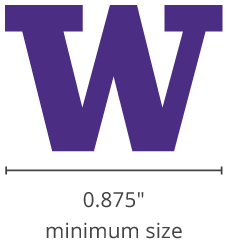 Our wordmark or department signature should be on the opposite side from the Boundless W.
Do not bleed the W off two sides. Do not bleed the W off the top.